Select ... DEWALT DWP849X 7-Inch/9-Inch Variable Speed Polisher with Soft Start (+ $195.00) 7' Metabo Variable Speed Polisher PE15-30 (+ $285.00) No, Thanks! 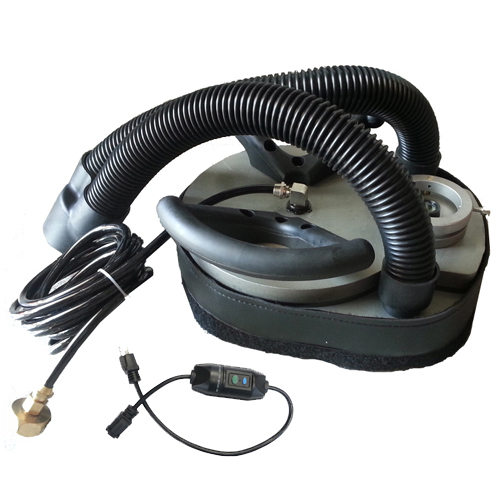 The T-Rex Planetary machine is a light weight, extremely portable planetary polishing machine with the most affordable price. 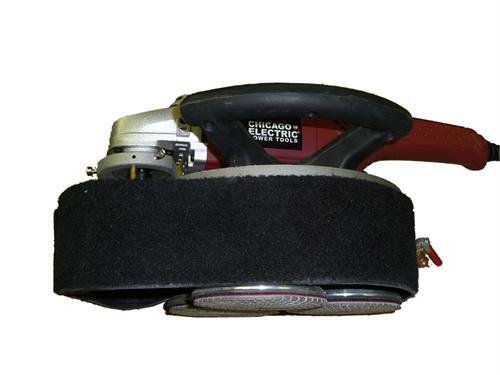 It is a rugged, planetary powered tool designed to produce a flat, swirl free finish on counter tops, floors and steps. 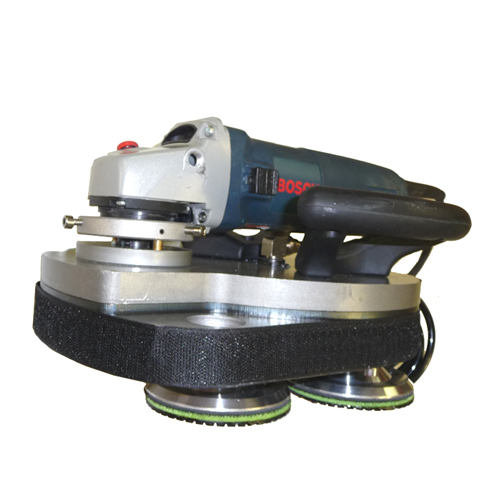 The planetary polishing tool can be used to grind, hone, polish and clean concrete, terrazzo, marble and granite surfaces with diamond abrasives. This is a true planetary gear driven tool. The 10" platform turns at a lower rate than the higher rotational speed of the 4 inch platens. This combination provides the optimal speed for diamond polishing, producing a perfect finish 5 times faster than a single head polisher. 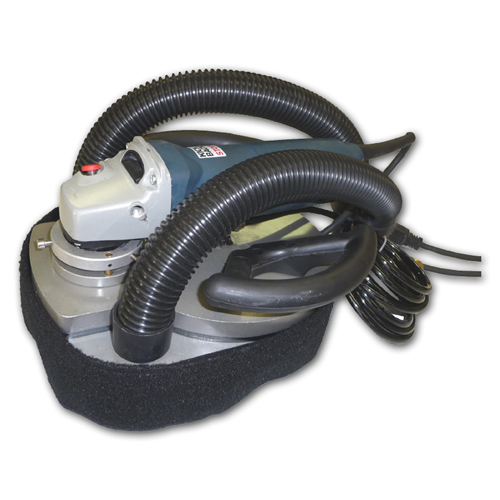 The unit is usually powered by electric variable speed grinder or polishers with a collar size of 2" (50mm) or smaller. A center cooling water feed line, precision bearings and gears translate to sturdy construction and the ultimate tool for perfect flatness and a superior mirror like polish. Price does not include grinder or polisher. 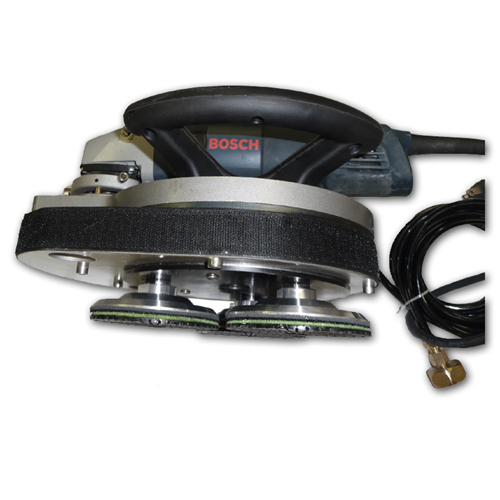 Recommended polishers: 7" Metabo variable speed polisher PE15-30, Makita 9227C, Dewalt DWP849x 7 inch polisher or similar polisher/variable speed polisher with 10 amps or other 7" variable speed polishers on the market. Installation of polisher/grinder to the planetary machine is very simple. However, you will need to first make sure that the collar of polisher/grinder is clear of any parts such as the lever for blade guard. You will need to remove the lever for blade guard/shroud first before installing it on T-Rex. After that, simply insert the spindle of polisher/grinder into the receiving female thread on the T-Rex machine, make sure that the machine is turned sideway, then switch on the polisher/grinder to let its spindle turn into the female thread of T-Rex. Once the spindle is snuggly locked into T-Rex thread, the planetary machine will start to run. Lock the collar of polisher/grinder to T-Rex with the 3 screws on the ring. 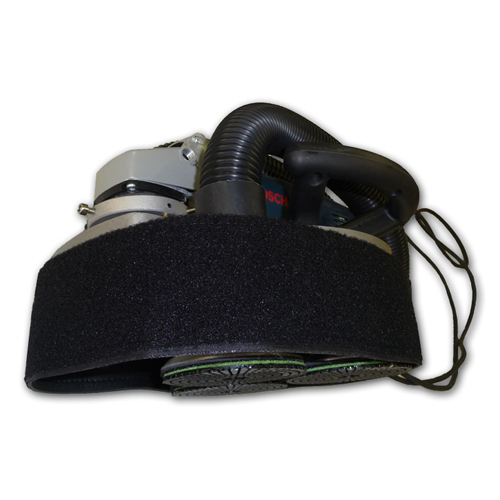 You may want to dedicate a polisher/grinder to be used with T-Rex. 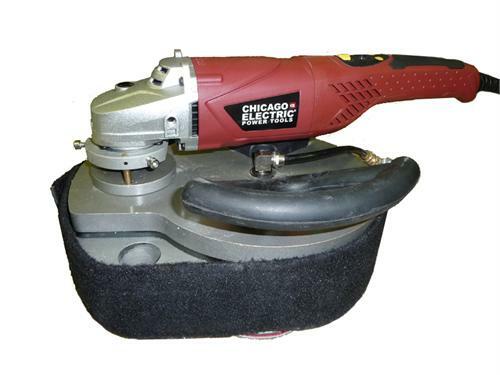 Once installation is complete, the only way to unscrew the polisher/grinder is to use a wrench to turn one of the 3 spindles on platen to the opposite direction while pushing down the locking button on the polisher/grinder, which is not very easy. Here is user manual for installing and uninstalling the polisher, also with an exploded view of T-Rex Polisher. The following video shows the T-Rex planetary polisher in action.